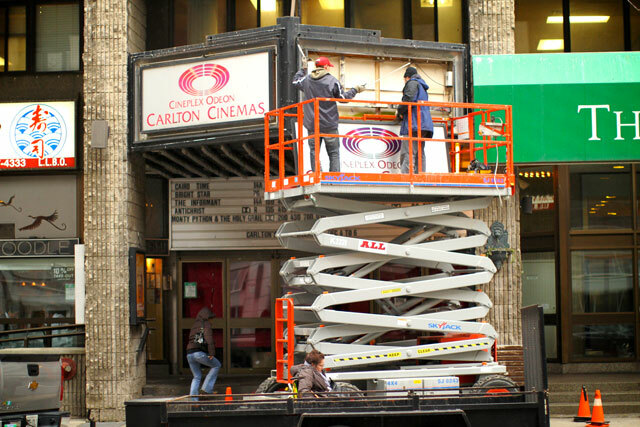 Workers dismantling the Carlton Cinemas’s marquee, earlier this afternoon. Photo by Christopher Drost/Torontoist. The most disorienting thing about being at Cineplex Odeon Carlton Cinemas last night was seeing all the “coming soon” stickers still affixed to posters for movies (Precious, The Fantastic Mr. Fox) that weren’t coming. Almost everything else going on in the multiplex’s lobby was business as usual, but the inaccurate stickers were a subtle reminder of how abrupt the announcement of the theatre’s closure had been. Until three weeks ago, few outside of Cineplex Odeon’s corporate offices knew that the Carlton’s demise was imminent. The art-house and second-run multiplex, which opened in 1981 (and is not to be confused with its previous iteration), was a victim of some of the same market forces that have caused other downtown cultural institutions to close over the course of the past year: rising rent, lease expiration, and big-box competition (in the form of the AMC theatres at Yonge-Dundas Square). Staff seemed resigned to the loss. “We all got transferred to other locations,” said the twenty-something girl working the theatre’s coffee bar. She felt a little let-down, she said. “But we’re here for a reason, so…” Then she handed us our small decaf coffee, which was normal in every respect, except for the fact that it was in a large container. They’d run out of shorter cups and hadn’t ordered more. Another worker at the popcorn and candy counter served a customer, then paused to rest his forehead on top of a cash register. The theatre’s management had left a signing book on a table in the lobby, for patrons to write farewell messages in. At least one hundred pages had been used, and the messages were lengthy and heartfelt. One man wrote that he’d started coming to the Carlton when he’d first moved to Toronto, because it was one of the only theatres where he’d felt comfortable on his own. Later, he met his wife, for the first time, on the theatre’s steps. A note by Atom Egoyan recalled that his first feature, Next of Kin, had finished its one-week theatrical run at the Carlton Cinemas twenty-five years ago. One note had been neatly typewritten on a separate piece of paper and pasted into the book, and there was something touching about that gesture—how deliberate it was. A group seated behind us in the theatre where Holy Grail was playing started to chat, before the movie. Guy: Do you remember the first movie you ever saw? Girl: The first movie I ever saw was here. It was Peter Pan.